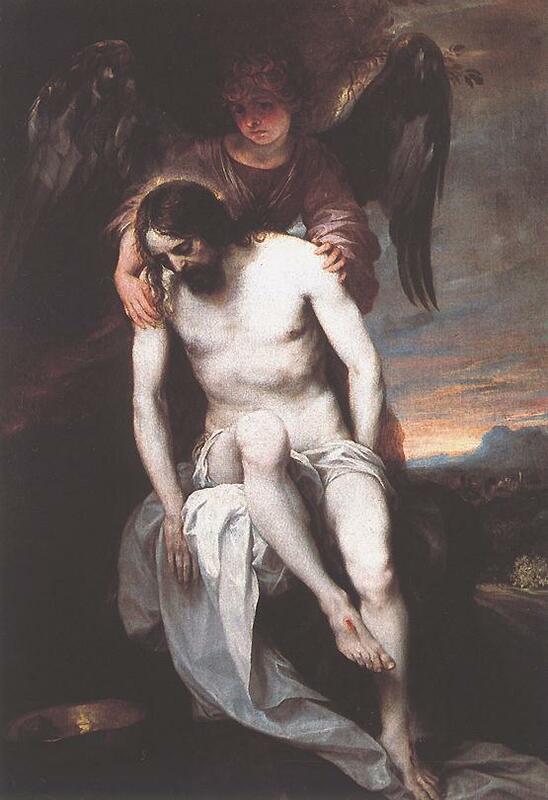 ^ Born on 03 September 1748: Dionys van Dongen, Dutch painter who died on 21 May 1819. � Born in Dordrecht, he was first a flower painter in Breda, and later became the student for two years of the flower painter J. Xavery in The Hague. In 1771 he moved to Rotterdam where he studied the works of Cuyp, Potter and Wijnants. His studio became a popular meeting place and his work achieved a certain reputation. An affliction of the eyes is said to have prevented him painting in old age. He died in Rotterdam. The few works now recorded include landscapes, animal subjects and seascapes, and reflect his admiration for seventeenth-century Dutch painting. ^ Died on 03 September 1667: Alonso Cano, Granada painter, draftsman, sculptor, and (rarely) architect, born on 19 March 1601. � He was an artist of rare versatility in 17th-century Spain. While he is also known for his drawings, only about 60 of these are definitely attributable to him, despite the many extant sketches with the name �Cano� added by later hands. Unlike most of his Spanish contemporaries, such as Zurbar�n or Vel�zquez, whose artistic styles did not outlive them, Cano�s artistic legacy is measured in part by the number of artists who were trained in his workshop and went on to become important masters in their own right: the painters Pedro Atanasio Bocanegra, Juan de Sevilla [1643�1695] and, more distantly, Jos� Risue�o, and the sculptors Pedro de Mena and Jos� de Mora, who began by following Cano�s models and then continued to produce polychrome sculpture in a distinctive style typical of Granada. Sebasti�n de Herrera and Juan Ni�o de Guevara were also students of Cano. 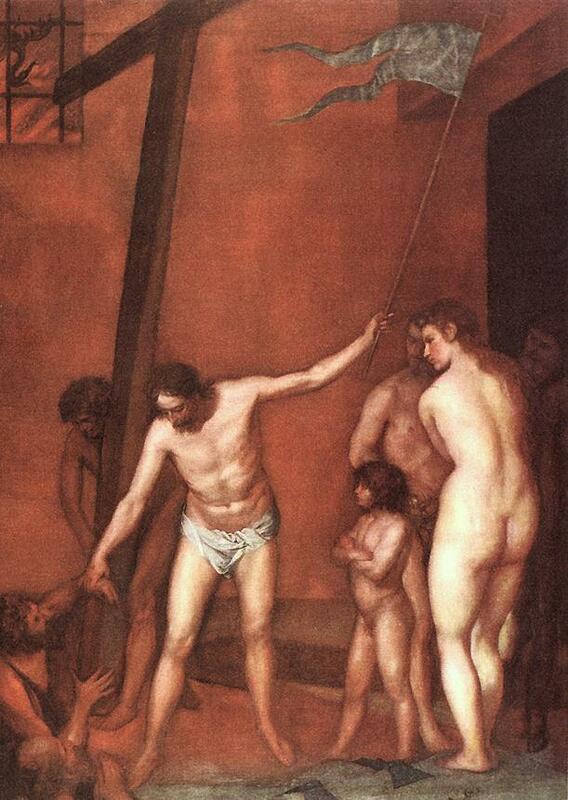 � Cano was sometimes called �the Spanish Michelangelo� because of the diversity of his talents. He was born and died in Granada, Spain, and worked there and in Seville and Madrid. His movements were partly dictated by his tempestuous character, for more than once he fled or was expelled from the city he was working in (once for the suspected murder of his wife). In spite of his violent temperament, his work tends to be serene and often sweet. He studied painting in Seville under Pacheco (Diego Vel�zquez [1599–1660] was his fellow-student) and sculpture with Mont��ez, and stayed in the city from 1614 to 1638, when he moved to Madrid to become painter to the Count-Duke Olivares and was employed by Philip IV to restore pictures in the royal collection. Thus he became acquainted with the work of the 16th-century Venetian masters, whose influence is apparent in his later paintings; they are much softer in technique than his earlier pictures, which are strongly lit in the manner of Zurbar�n. From 1652 he worked mainly in Granada, where he designed the fa�ade of the cathedral (1667), one of the boldest and most original works of Spanish Baroque architecture. He was ordained a priest in 1658, as this was necessary for him to further his career at Granada Cathedral. 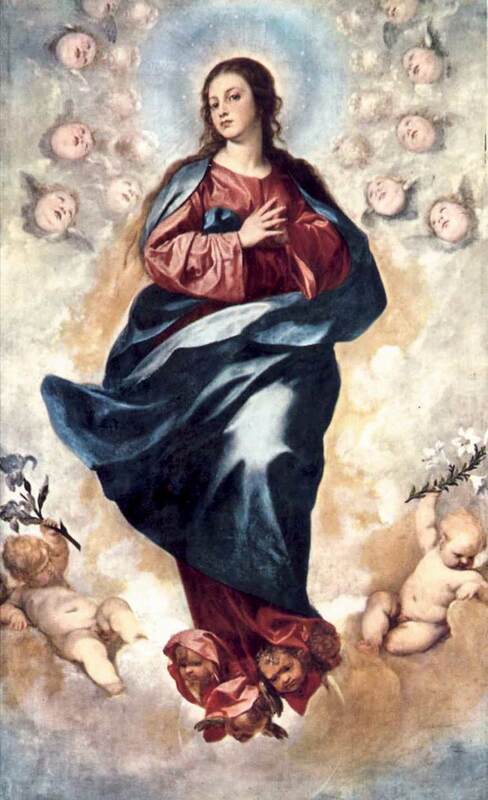 The cathedral has several of Cano's works in painting and sculpture, including a polychrome wooden statue of the Immaculate Conception (1655) that is sometimes considered his masterpiece. — He received his first lessons in art from his father, Miguel Cano, an architect. Later he studied sculpture under Juan Monta��s, and painting under Pacheco and Juan del Castillo. 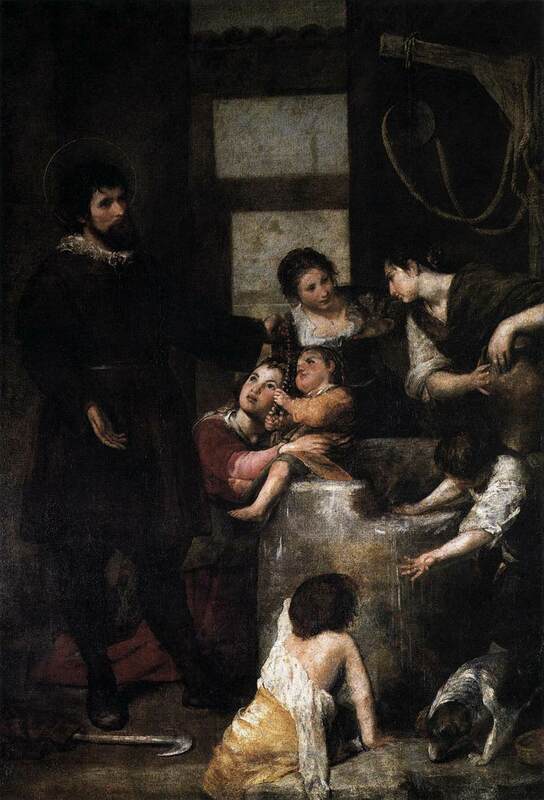 In 1625, when Herrera, the sculptor, was his teacher, he attained great fame by producing three colored statues, now in the church at Lebrija: "The Virgin and Child", "St. Peter", and "St. Paul". They are all superb pieces of statuary, but the first is a masterpiece, conceived and executed in a noble, classical, simple style that rightly earned for Cano the title of the "Michelangelo of Spain". Besides his single figures in marble, he chiseled many beautiful retables, or monumental altar-pieces. Cano went to Madrid in 1637, and through the influence of the Duke of Olivarez and of Velázquez, but chiefly because of his own merit, was made Master of the Royal Works, Painter to the King, and first in rank among the instructors of Don Balthasar Carlos. In Madrid he contributed plans for several palaces, city gates, and a triumphal arch for the entrance of Maria Anna of Austria, wife of Philip IV. In 1650 he became architect of the cathedral of Toledo. Cano was suspected of having murdered his wife, and was unjustly condemned and ordered to leave Madrid. 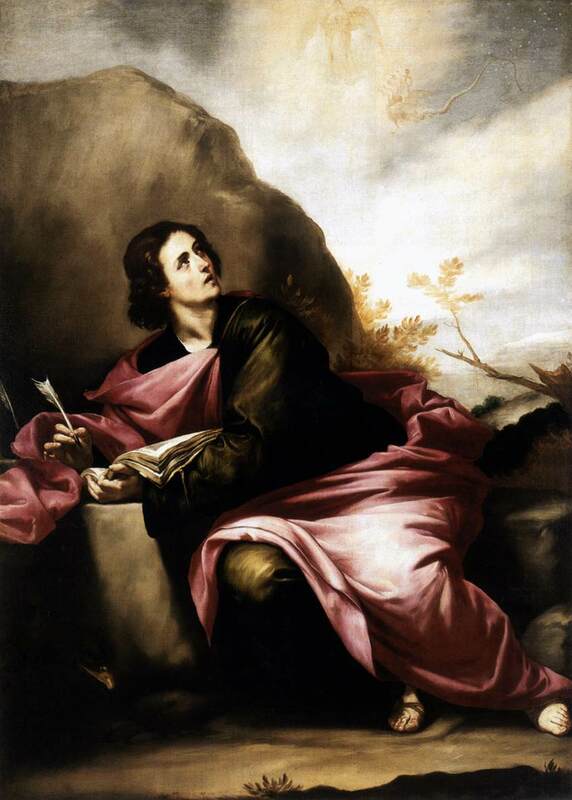 He took refuge in Valencia, attained marked success there, painted a "Nativity", and a "St. John" for the city's great church, and entered the Carthusian convent, so as to be able to devote himself wholly to painting, which henceforth occupied him to the exclusion of sculpture. Tardy justice was done him when he returned to Madrid. He was restored to royal favor, but Cano felt that his only surety was in the Church; therefore he took orders and became a resident of Granada. In 1652 Philip IV appointed him a canon in the cathedral of Granada. To the churches of Granada and Malaga he presented many pictures and statues. A councilor of the former city, having ordered a statue of St. Anthony of Padua from Cano, was charged one hundred doubloons, whereat he demurred, saying that the artist was demanding four pistoles per day for twenty-five days' work, which was more than he, Cano's superior, could earn. "It has taken fifty years of study to produce this!" cried Cano, hurling the statue to the pavement. For this indignity to a saint he was suspended by the Chapter of Granada. In 1658 the king restored Cano, and required him to complete a crucifix which the queen had ordered. Cano was a greater sculptor than painter, but he would have attained fame as a painter even had he never worked in marble. His earlier work in color was tentative, eclectic, and of little originality, but his later pictures, which fill the churches of Granada and Malaga, are splendid in drawing, brilliant in a coloring that vividly recalls Van Dyck's, full of imagination, and bold in design. His flesh tints are pure, the pose of his figures is statuesque, the lines are sharp, vigorous, and classical, and he had a profound knowledge of chiaroscuro. Cano led an exemplary life, his great fault being his ungovernable temper; he was industrious, studious, and very generous. It is related of him that, often, when he had no money for alms he would make a drawing for the beggar to sell. His abnormal antipathy to Jews was exemplified on his death-bed when he refused the Sacrament from a priest who had given it to converted Jews. Among his works mention may be made of: "St. Agnes" (Berlin); "The Dead Christ" (Madrid); "Virgin and Child" (St. Petersburg); "St. Anthony of Padua" (Munich); "Madonna and Child", sculpture, in the church of Lebrija (the ancient city of Nebrissa). (Alonzo or Alonso) Spanish painter, architect and sculptor born in Granada. He learned architecture from his father, Miguel Cano, painting from Francisco Pacheco. [1564-1654] the master of Vel�zquez, and sculpture from Juan Mart�nez Monta��s. As a sculptor, his most famous works are the Madonna and Child in the church of Lebrija (also called Nebrija), and the colossal figures of San Pedro and San Pablo. Philip IV made him royal architect and kings painter, and gave him the church preferment of a canon, 1658, in order to take up a position as chief architect of the cathedral of Granada, where his main achievement in architecture was the façade, designed at the end of his life and erected to his design after his death. He was notorious for his ungovernable temper; and it is said that once he risked his life by committing the then capital offence of dashing to pieces the statue of a saint, when in a rage with the purchaser who begrudged the price he demanded. According to another story, his passionate nature also caused him to be suspected of the murder of his wife, and even tortured, though all other circumstances pointed to his servant as the culprit. After the death of his wife he took Holy Orders. — Nacido en Granada, ciudad en la que se forma, en el taller de su padre Miguel Cano, y donde se convierte en la m�xima figura de la escuela andaluza. Hombre de amplia cultura, m�s cercano al mundo renacentista, ut�pico y so�ador, de fuerte car�cter, luch� por conciliar la realidad con lo ideal. Llev� una vida agitada, y sufri� tortura y c�rcel. En 1615 se establece en Sevilla, junto a su padre, y en ella desarrolla su vocaci�n de pintor; estudi� en el taller de Pacheco desde 1616 a 1621, al tiempo que est� realizando su aprendizaje Diego Vel�zquez, en el mismo taller, con quien traba una amistad duradera y con quien se reencuentra m�s tarde en Madrid. En este momento tambi�n conoce a Mart�nez. — Born in Granada, he moved to Seville in 1614. He learned painting from. Forced to leave Seville in 1637 because of a duel with the painter Llano y Vald�s, he fled to Madrid and obtained the favor of the court. His activities as court painter ended in 1644, when, suspected of the murder of his wife (of which a servant was probably guilty), he escaped to Valencia. He then returned to King Philip IV and successfully solicited a position as canon in the cathedral in Granada in 1652, but he was expelled for misbehavior in 1656. Returning to Madrid, he took holy orders and was appointed chief architect of the Granada cathedral, a position he held until his death. Cano painted extensively in Sevilla, Madrid, and Granada. The Sevilla paintings, among them Via Crucis and St. Francis Borgia, are influenced by Zurbar�n, monumental and bold, with strong emphasis on darkness. The Madrid paintings, including St. Isidore's Miracle of the Well (1646), are more impressionistic, foreshadowing the work of Diego Vel�zquez [1599–1660]. Finally, the last paintings, from his stay in Granada, especially the Mysteries of the Virgin in the Cathedral, are harmonious, with a classic balance and symmetry. � Saint Bernard and the Virgin (800x564pix, 114kb) _ A statue of the Virgin Mary is miraculously squirting her milk into the mouth of Saint Bernard, who was praying for her intercession in getting him cured of an infection (according to a legend). Milk was a much-used image to suggest the eternal spiritual nourishment flowing from the Church. � Descent into Limbo (1640; 860x611pix, 92kb) _ From 1640 on, Cano's technique became increasingly pictorial, that is to say, increasingly Baroque, acquiring some of the subtleties he had previously ignored. Perhaps his most important painting is the Descent into Limbo, a strange, rather illustrative composition, anecdotal in the movement imparted to the figures, but including one of the rare, and one of the most beautiful female nudes in Spanish art..
� Mary (1648, 49x43cm _ ZOOM to 1835x1576pix, 251kb) _ Probably a fragment of a larger painting. There are two somewhat similar representations of Mary by Cano, both are darker than this intimate picture painted with devotion. � Noli me Tangere (1640, 142x110cm) _ Cano was a painter, sculptor and architect and worked for varying periods in nearly every large town in Spain � Madrid, Seville, Valencia and Toledo. 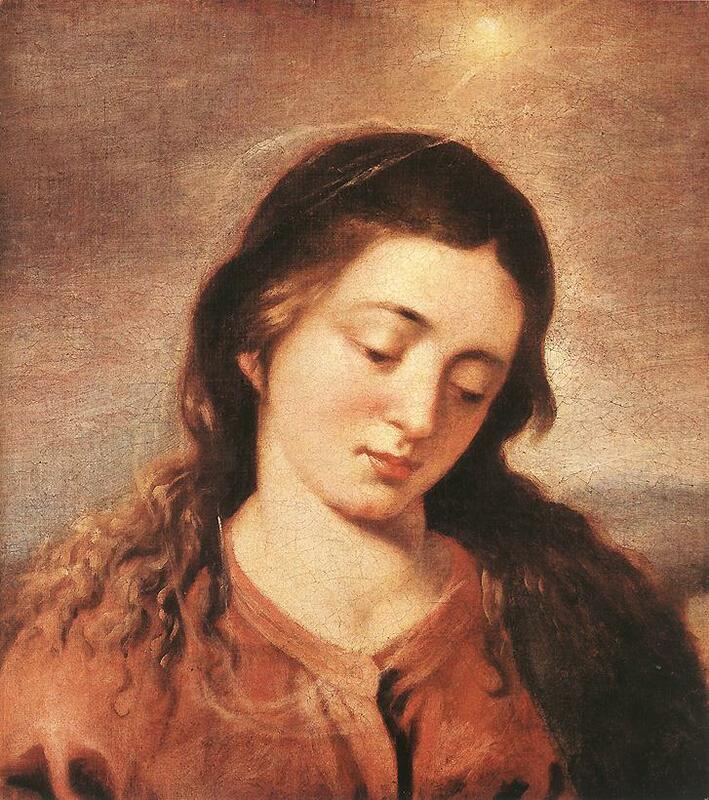 His oeuvre is very rich, though more restricted in range than that of Vel�zquez or Murillo, for he painted almost exclusively religious subjects, keeping strictly to the accepted ecclesiastical tradition. Cano never went to Italy but was strongly influenced by the Italian masterpieces in the Spanish royal collection. 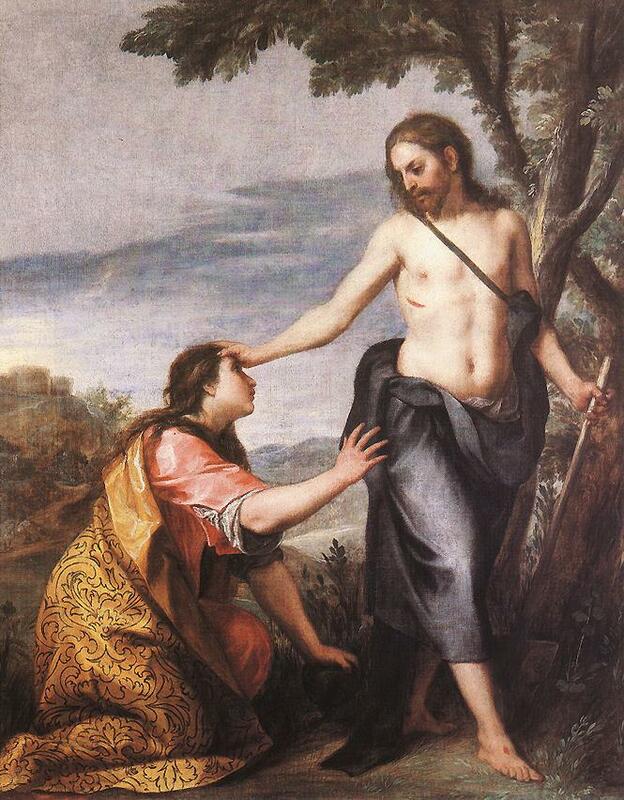 The composition of Noli me Tangere owes much to the inspiration of Correggio's 1525 painting of the same subject, which was in Madrid at that time, and the coloring shows the influence of Venetian masters, especially Titian. 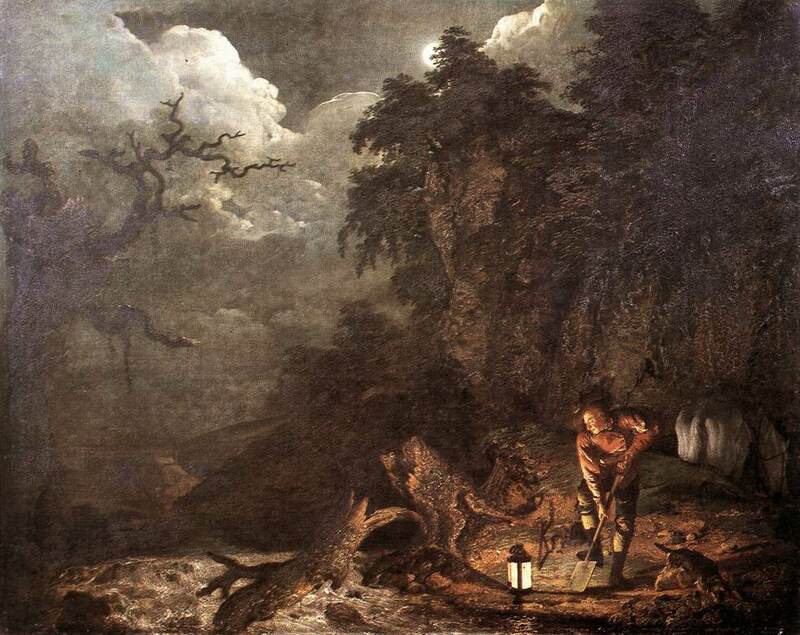 ^ Born on 03 September 1734: Joseph Wright of Derby, English Romantic painter who died on 29 August 1787. � Wright of Derby was a pioneer in the artistic treatment of industrial subjects. He was also the best European painter of artificial light of his day. 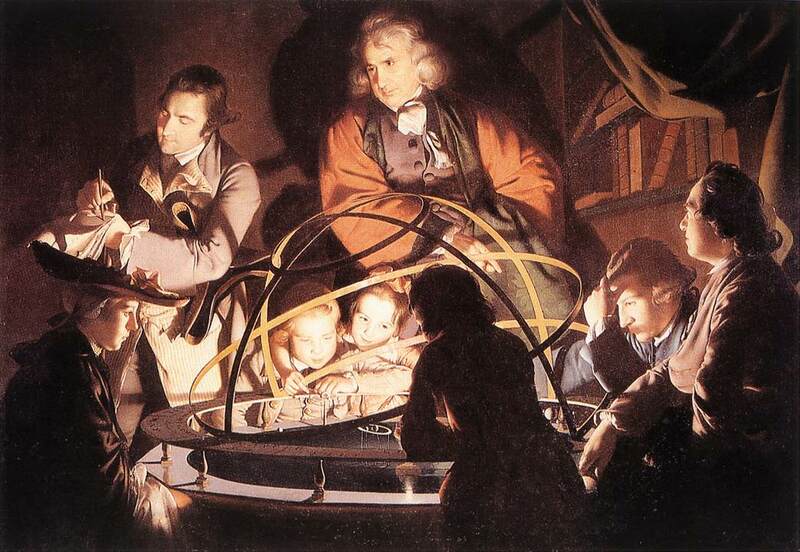 � A Philosopher Lecturing with a Mechanical Planetary (1766, 147x203cm) _ Like other artists, Joseph Wright went to Italy, but he was more interested in its natural effects than its art. It is apt that he should be known as Wright of Derby, for it was there that he was to find pioneers of science and industry who provided him with subject-matter and with patrons. His is a provincial milieu, with serious rather than sophisticated interests, more doggedly bourgeois than the capital, and still optimistic about the benefits of progress. As Hogarth has been the initiator of 'la peinture morale', so Wright was the initiator, and the finest exponent, of the century's final contribution to genre: the industrial picture. � Miravan Opening the Grave of his Forefathers (1772, 127x102cm) _ Antiquity was the great theme in British painting in the last decades of the 18th century. Its influence can be traced in two areas particularly - in literature, which often comes close to the macabre, and in the excavations of antique sites, which were followed with intense interest at the time. 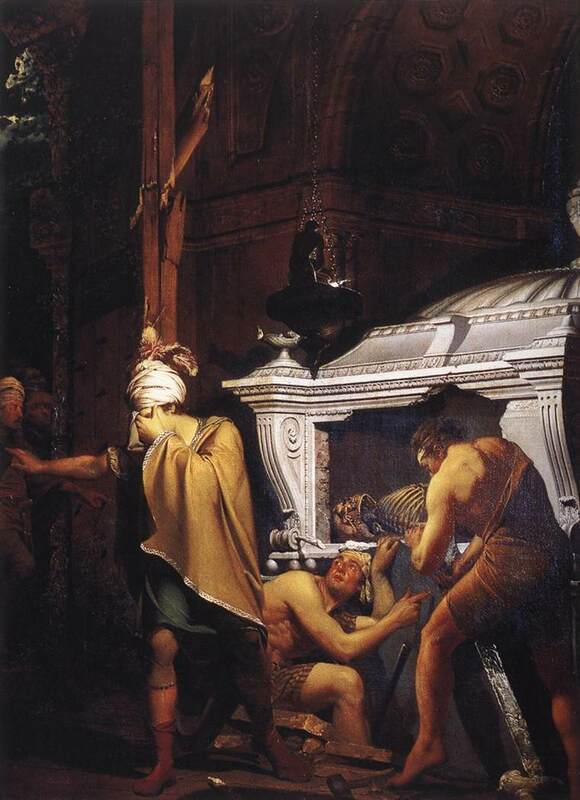 Joseph Wright's Miravan Opening the Grave of his Forefathers illustrates an example from literature. One story is that Miravan found on the grave of his forefathers the inscription: "In this grave lies a greater treasure than Croesus possessed." But the central character finds only bones and another inscription: "Here dwells rest! Criminal, you seek gold among the dead? Go, greedy one, you will never find rest!" The subject has a double meaning. It not only illustrates the legend itself, but was also probably intended as a criticism of the growing desecration of antique sites. 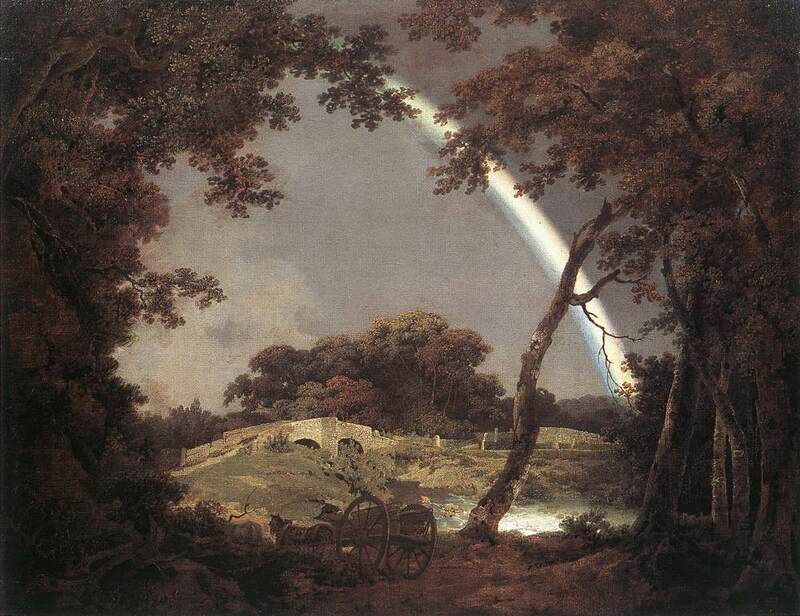 � Landscape with Rainbow (1795, 81x107cm) _ This late work of the artist, depicting a landscape near Chesterfield, shows reminiscences of his journey to Italy. � The son of the well known French painter and sculptor Joseph-Fr�d�ric-Charles Soulacroix [Montpellier 06 Jul 1825 � Firenze 1899] and of Giacinta Diofebo, Fr�d�ric lived until spring 1863 in Rome and later in Boulogne-sur-Mer (where his father Charles was painting the frescoes of the local cathedral), in Paris and, since 1870, in Italy in Firenze. In 1873, at 15, Fr�d�ric enters the Accademia di Belle Arti of Firenze and in Octobre 1876 is admitted to the Scuola di Pittura. On 06 June 1890, he marries, in Firenze, Julie Fernande Blanc. They live in Piazza Donatello, 21, in a charming house with rear garden they acquire. Firenze sees the birth of four boys: Olivier, George, Gabriel and a girl, Am�lie Florence. In 1924 he is madeOfficier d�Acad�mie by the French Authorities. In 1933 he dies in Cesena. Am�lie was married in 1924 to prince Urbano Chiaramonti, nephew of Pope Pius the VII. Soulacroix is buried in the Chiaramonti tomb. Soulacroix was an artist who enjoyed an enormous success. His paintings were mainly for private customers coming from the US, England, Germany (Munich especially), South America, Canada. He made a portrait of the Queen Margherita wife of King Umberto I of Italy and those of the King of Siam and his brother Prince Sanbasaska. In recent sales and in pictures of his works appearing from time to time on the �web� (e.g. all the pictures shown above), Fr�d�ric is very often confused with his father Charles. Fr�d�ric�s signature is however unmistakable: his works are always signed F.Soulacroix - generally in red - whilst Charles always signed C. or Ch.or Charles Soulacroix. ^ Born on 03 September 1914: Cundo Berm�dez, Cuban painter, ceramicist, and printmaker. � Born in La Habana, he studied there at the Academia de San Alejandro (early 1930s) and in 1938 at the Academia de San Carlos in Mexico City, where he became familiar with the work of the muralists. He had his first one-man exhibition at the Lyceum in Havana in 1942. In his own words: "When I was young I wanted to be a writer; although I studied at San Alejandro, I never intended to take art seriously. The thirties was a decade of labor strikes and university closings; the economic situation was terrible by the time I went to Mexico in 1938. I was never awarded a scholarship in Cuba; I have never had material ambitions, and have been very independent. When the news come of Batista's coup d'etat in 1952, I was vacationing in Europe. I returned home, and dedicated myself full time to painting. It has been like that ever since. I have fun at what I do; the pleasure I get from painting is vital for me. I enjoy art like Mozart enjoyed his music. Some people are concerned over philosophic postulates, over universal chaos, over the atomic bomb; for me, painting is a celebration of form and color, and nothing more. I left Cuba absolutely disillusioned, perhaps because I had believed totally in the revolution. Between 1962 and 1967, the government obliterated me; I was neither harassed nor persecuted, simply ignored. Exile has affected the individual, not the artist; when I arrived in Puerto Rico, I felt as if I had reached a region of Cuba I had not known previously. In a way, I still feel uprooted, for I do not feel at home anywhere." � Berm�dez naci� en La Habana en un tiempo trastornido por el estallido de la Primera Guerra Mundial. En 1926, Berm�dez ingresa en el Instituto de La Habana, y en 1930 matricul� en la Academia de San Alejandro, donde estudi� pintura durante dos a�os. En 1934, ingresa en la Universidad de La Habana con el prop�sito de estudiar Derecho Diplom�tico y Ciencias Sociales. Se grad�a en 1941. Trabajaba, estudiaba, y pintaba. En 1937 trabaj� en la revista Selecta, fundada por L�pez Serrano, propietario de librer�a La Moderna Poes�a. El arte cubano vive un auge extraordinario en las d�cadas de los a�os 20, 30 y 40. A partir de 1927, se desarrolla en Cuba un inter�s especial por el arte moderno. Ese mismo a�o se funda en La Habana la revista Avance. Posteriormente aparecer�an Verbum, Nadie Parec�a y Espuela de Plata. En 1944 nace la revista de arte y literatura Or�genes, de la mano de importantes intelectuales cubanos, entre ellos el poeta y ensayista Jos� Lezama Lima. En 1936 Eduardo Abela funda el Estudio Libre para Pintores y Escultores, con la colaboraci�n de los pintores Mariano Rodr�guez y Ren� Portocarrero y del escultor Alfredo Lozano, amigo de Berm�dez. Finalmente, la Direcci�n de Cultura del Ministerio de Educaci�n funda el Instituto Nacional de Artes Pl�sticas en 1940. Cundo Berm�dez no es ajeno a este torbellino que viven las artes cubanas. M�s bien forma parte del fen�meno. Dos importantes generaciones de artistas pl�sticos cubanos cruzan sus obras, la del 27 y la del 40, a la que corresponde la labor de Cundo, con su formidable talento para el uso de la luz y del color. Junto a otros pintores y a manera de protesta por la ausencia de galer�as de arte, Berm�dez expone sus obras en los �rboles del Parque Albear en 1937. All� estuvieron sus cuadros Bailarina, Callejas de mi escuela, Cloroformo, Retrato de Rafael Llerandi y Salida del taller. Fue el �nico del grupo que alcanz� relieve internacional posteriormente. En 1938 se organiza la "Exposici�n nacional de pintura y escultura". Berm�dez tiene una destacada participaci�n. Luego, viaja a M�xico y estudia en la Academia de San Carlos. No pudo ocultar su admiraci�n por las obras de figuras como Rivera, Orozco, y Siqueiros, especialmente las realizadas por ellos antes de que expusieran sus compromisos pol�ticos a trav�s del arte. Se hizo amigo de Rufino Tamayo. En 1941, participa en la "Exposici�n de Arte Cubano Contempor�neo", del Lyceum de La Habana, donde vende su primer cuadro: Dos ni�os. En 1943, se inaugura "Una Exposici�n de Pintura y Escultura Moderna Cubanas", organizada por Jos� G�mez Sicre en La Habana. Asiste el mexicano David Alfaro Siqueiros y dice lo siguiente: "Cundo Berm�dez representa audacia en las artes pl�sticas. El sabe c�mo construir de una manera sincronizada. Con tonos y primeros planos situados en profundidad pict�rica, en contraposici�n, �l construye y organiza, a veces de manera casi milagrosa. Yo creo que este artista ha tenido gran importancia en la gama crom�tica de la pintura moderna cubana". En 1944 se inaugura la Exposici�n de Pintura Cubana en el Museo de Arte Moderno de Nueva York (MOMA). El director del museo, Alfred H. Barr, dice que la obra de Berm�dez es "humor�sticamente arcaica, pero vigorosa y original con sus armon�as de color met�lico". Esta exhibici�n es el principio de la carrera art�stica internacional de Cundo Berm�dez. En la actualidad dos de sus cuadros, El balc�n y La barber�a, son parte de la colecci�n permanente del museo. Con la llegada al poder de Fidel Castro en 1959, Cundo participó en gestiones para la liberaci�n de prisioneros pol�ticos. Expuso en Chile y Per�. En Chile se reuni� con Carre�o, que viv�a en ese pa�s suramericano, y con el poeta Pablo Neruda, a quien conoc�a de antes. En medio de dificultades, regresó a Cuba, donde, al igual que otros artistas, fue sometido a un aislamiento irracional. Periodistas e intelectuales que visitan la isla preguntaban por �l. Se les respondía: "Cundo es un anciano de salud muy delicada que vive en una finca alejada de La Habana". En realidad, Cundo ten�a poco m�s de 40 a�os y estaba en plenitud de facultades. Se le negó materiales para trabajar. No se le invitó a exposiciones nacionales. Pintó casi en el clandestinaje. A finales de la d�cada de los 60 logró abandonar Cuba rumbo a Estados Unidos. Poco despu�s se establece en Puerto Rico. En 1996 se estableció en Miami. ^ 1996 Emily Kame Kngwarreye, Australian aboriginal painter from the Utopia community in the Northern Territory; born in 1910. � Alalgura Awelye (1991; 987x800pix, 305kb) fairly uniform and repetitive pattern of tiny circles, suitable at best for wallpaper. _ Doc Cod Something aka DCCD2 (2006; 660x932pix, 236kb) �(070803). 1937 Fran�ois-Joseph Guiguet, French artist born on 09 January 1860. 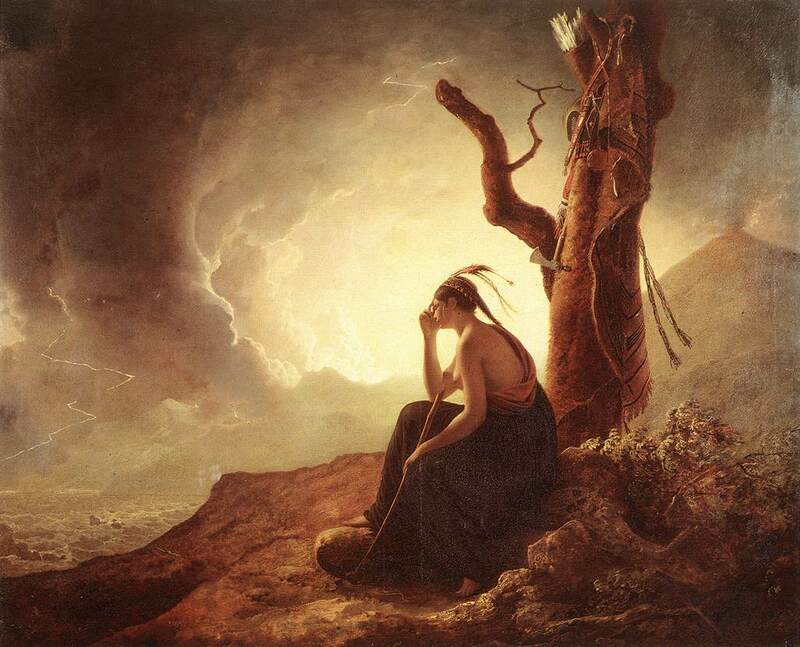 1796 Heinrich Hirt, German artist born on 12 September 1727. 1899 (3 Nov?) David Joseph Bles, Dutch painter and printmaker born on 19 September (19 November?) 1821. He received his first training at the drawing academy in The Hague. He then worked in the studio of Cornelis Kruseman from 1838 to 1841, at the same time as Alexander Hugo Bakker Korff. Bles studied under Joseph Robert-Fleury in Paris in the following two years. Back in The Hague in 1843, he quickly attracted attention with his submissions to exhibitions. He specialized in the playful depiction of the well-to-do middle classes in domestic settings, often with a coquettish young woman as the main character. >1802 Carl Georg Adolph Hasenpflug, German artist who died on 13 April 1858. 1651 Jan Pauwel Gillemans II, Flemish artist who died before 09 October 1704. 1623 Pieter Wouwerman, Dutch painter who died on 09 May 1682. He was the son of Pauwels Joostens Wouverman of Alkmaar [�28 Sep 1642] and brother of Philips Wouwerman [bapt. 24 May 1619 � 19 May 1668] and of Johannes Wouverman [1629-1666]. Pieter Wouverman made copies of works by Bamboccio (several of which he burned on the eve of his death) and by Teniers.